An innovative filtering material may soon reduce the environmental cost of manufacturing plastic. Created by a team including scientists at the National Institute of Standards and Technology (NIST), the advance can extract the key ingredient in the most common form of plastic from a mixture of other chemicals—while consuming far less energy than usual. The material is a metal-organic framework (MOF), a class of substances that have repeatedly demonstrated a talent for separating individual hydrocarbons from the soup of organic molecules produced by oil refining processes. MOFs hold immense value for the plastic and petroleum industries because of this capability, which could allow manufacturers to perform these separations far more cheaply than standard oil-refinement techniques. This promise has made MOFs the subject of intense study at NIST and elsewhere, leading to MOFs that can separate different octanes of gasoline and speed up complex chemical reactions. One major goal has proved elusive, though: an industrially preferred method for wringing out ethylene—the molecule needed to create polyethylene, the plastic used to make shopping bags and other everyday containers. However, in today’s issue of the journal Science, the research team reveals that a modification to a well-studied MOF enables it to separate purified ethylene out of a mixture with ethane. The team’s creation—built at The University of Texas at San Antonio (UTSA) and China’s Taiyuan University of Technology and studied at the NIST Center for Neutron Research (NCNR)—represents a major step forward for the field. Making plastic takes lots of energy. Polyethylene, the most common type of plastic, is built from ethylene, one of the many hydrocarbon molecules found in crude oil refining. The ethylene must be highly purified for the manufacturing process to work, but the current industrial technology for separating ethylene from all the other hydrocarbons is a chilly but high-energy process that cools down the crude to more than 100 degrees below zero Celsius. Ethylene and ethane constitute the bulk of the hydrocarbons in the mixture, and separating these two is by far the most energy-intensive step. 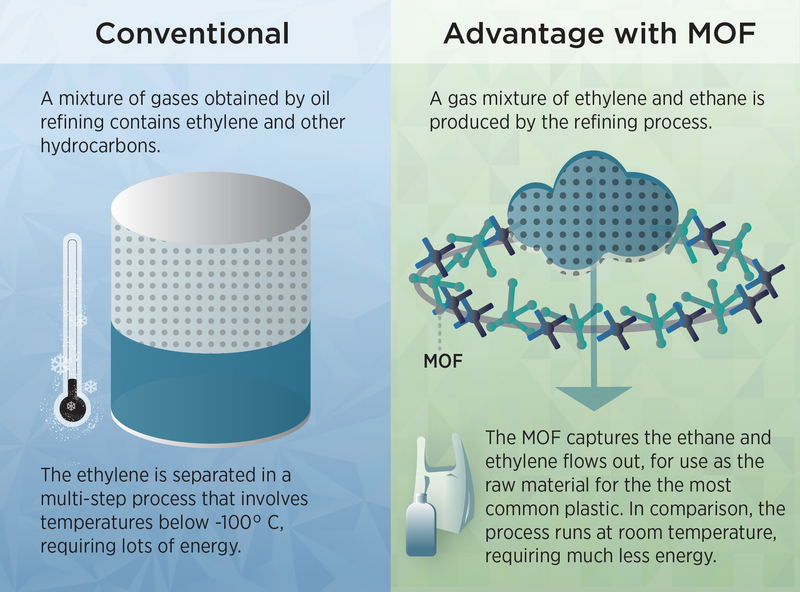 Finding an alternative method of separation would reduce the energy needed to make the 170 million tons of ethylene manufactured worldwide each year. Scientists have been searching for such an alternative method for years, and MOFs appear promising. On a microscopic level, they look a bit like a half-built skyscraper of girders and no walls. The girders have surfaces that certain hydrocarbon molecules will stick to firmly, so pouring a mixture of two hydrocarbons through the right MOF can pull one kind of molecule out of the mix, letting the other hydrocarbon emerge in pure form. The trick is to create a MOF that allows the ethylene to pass through. For the plastics industry, this has been the sticking point. The research team spent years trying to crack the problem. In 2012, another research team that worked at the NCNR found that a particular framework called MOF-74 was good for separating a variety of hydrocarbons, including ethylene. It seemed like a good starting point, and the team members scoured the scientific literature for additional inspiration. An idea taken from biochemistry finally sent them in the right direction. This iron-based metal-organic framework decorated with peroxo groups can capture ethane while allowing ethylene to pass through, potentially providing a more efficient and cost-effective way to purify ethylene, the most important raw material for plastic production. The team reasoned that to break the bond in a hydrocarbon molecule, the compound would have to attract the molecule in the first place. When they modified MOF-74’s walls to contain a structure similar to the compound, it turned out the molecule it attracted from their mixture was ethane. The team brought the MOF to the NCNR to explore its atomic structure. Using a technique called neutron diffraction, they determined what part of the MOF’s surface attracts ethane —a key piece of information for explaining why their innovation succeeded where other efforts have fallen short. While Zhou said the team’s modified MOF does work efficiently, it may require some additional development to see action at a refinery.